Find our cheapest flights to Hamilton from Palmerston North, Wellington, and Christchurch. Beautifully positioned on the banks of the Waikato River, Hamilton is at the heart of the Central North Island and the Waikato farming regions. The city has a great café and bar scene, with everything from high-energy student bars to romantic fine dining. Less than an hours drive from Hamilton, the Hobbiton Movie Set tour will transport you to Middle-earth, the magic world of The Lord of The Rings and The Hobbit film trilogies. 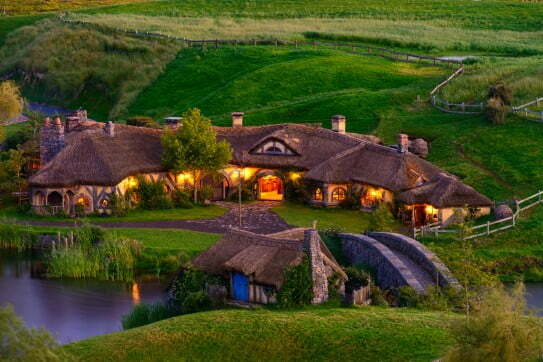 Built on a private farm, the 12-acre set includes the lush pastures of the Shire, Hobbit Holes (houses), the Mill and the famous Green Dragon Inn. Wander the Shire with your guide and hear fascinating stories of how the movies were made, then enter the Green Dragon Inn to enjoy a locally brewed refreshment from the Southfarthing range. At Waitomo you can go underground to experience a world of countless glow worms and magnificent limestone formations. Drift gently through the caves in a boat or lift the adrenalin levels with a black water rafting tour, where youll wear a wet suit and hard hat while floating along underground streams in on an inflatable tube. Several caves also offer easy one or two-hour walking tours. You can also abseil down a rope deep into the earth for the beginning of a half-day Lost World subterranean adventure that has it all. Just 45 minutes west of Hamilton by car is Raglan, which has one of the longest left-hand surf breaks in the world. This charming beachside town has a relaxed bohemian vibe, a longstanding creative culture and a great selection of cafés. If youre an experienced surfer, its possible to ride the break at Manu Bay for up to two kilometres. For those who arent proficient on the waves,Ocean Beach provides an idyllic spot to relax, swim, body board or take a surf lesson. Raglan also has a tranquil harbour thats ideal for kayaking and paddle boarding - everything you need is available for hire locally. Drift gently through the caves in a boat with your informative guide, or lift the adrenalin levels with a black water rafting tour wearing a wet suit and hard hat. Set on the banks of the Waikato River, the award-winning Hamilton Gardens is the regions most popular attraction. More exciting than a traditional botanic garden, this 54-hectare public park features 21 themed gardens representing different civilizations or historical garden styles. Drop in for a quick break or spend the day exploring the gardens and relaxing on the lawns. You can pack a picnic, pre-order a picnic basket from the Gardens Cafe or enjoy anything from a quick coffee to alfresco dining with beautiful lake views. To learn more about the worlds gardening styles, book in for one of the guided tours. If youre traveling with children, theyll love the garden-themed playground and fun activity sheets. From the gardens, you can also take a 90-minute rriver cruise on the Waikato River. If you're visiting Hamilton to surf at Raglan, it will be more pleasant in summer and autumn. Hamilton Gardens are gorgeous in spring, when rainfall is more frequent. Morning fog is fairly common in winter, usually giving way to a calm sunny day. Green Dragon image courtesy of Hamilton and Waikato Tourism.